Swann is a company that offers a wide variety of security cameras. They come in a variety of shapes and sizes with multiple features available depending on the type of security you feel you need in your home. Due to the boom in smart home security cameras in recent years, Swann has managed to keep up with most of the competition by creating newer cameras to add to their lineup. Their most popular camera currently on the market however is their motion sensor camera outdoor. Here is the Swann Thermal Sensor Outdoor Security Camera review 2018. While indoor security cameras are extremely important to protecting the home, having a well-placed motion sensor camera outdoor can make a huge difference. Swann has made sure to make strides in improving on their older products. Their thermal sensor outdoor system offers a True Detect PIR Thermal Sensing technology that is able to detect heat-generated objections in motion. This would usually include things like large pets, cars and most importantly, people. A thermal sensing system boasts the ability to eliminate false alarms that motion sensing is more prone to experience. Triggers such as falls leaves, bugs, or even rain. In reality, with the modern technology cameras are capable of; these types of false alarms are much less likely. These Swann outdoor cameras offer a quality picture with 1080p video. The HD picture offered in the live recordings allows for easier detail identification. This can help with faces, clothing, or even license plates when trying to identify an incident. This is comparable to what the other top outside security cameras on the market are currently offering in terms of picture quality. Where this camera falls a bit short is on the installation. It requires BNC cables to be hardwired outside to work. If the homes is already hardwired with the proper cables, Swann will still suggest considering rewiring with their BNC cables. With so many features, you might consider Swann to be among the best outdoor security cameras on the market. Like any decent motion sensor camera outdoor, the Swann cameras offer infrared night vision. These cameras can capture clear images in the dark up to 100ft. An ideal placement to consider would be a porch, near a door. Getting the best view of this area will ensure that you catch any burglars or intruders as they enter your property. Also, the front door is the most common place for an intruder to try to gain entry into the home. Due to it being the most common entry point that burglars use, it’s important to cover to keep a recording eye on it at all times. The Swann indoor cameras come with free, seven-day local storage for captured video feeds under 20-seconds in length means that the Swann system is not cloud dependent. Swann does offer two days of free cloud storage with an optional 30-day/5GB plan for $/month or $70/year. The outdoor package however, comes with 8 weatherproof cameras and a massive 1TB hard drive. You can customize a package to better suit your personal security needs. This means you can change the amount of cameras you think you may need and even include indoor and outdoor cameras. 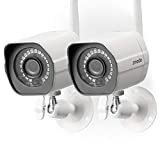 If you are interested in outdoor home security cameras that can easily integrate throughout your entire smart home, look no further than Protect America. Offering top of the line products at the best rates with price-matching and locked in contracts. Contact Protect America and ask them how they can secure your entire home with fully customized security solution.